A deck is one of the best home improvements you can make in terms of adding home value and there’s nothing quite like a deck for entertaining, relaxing, grilling or simply enjoying the outdoors. With so many options and available features, planning your perfect deck just got easier with the expert help at Iverson’s Lumber. With locations in Highland and Montrose and serving Michigan communities from Ann Arbor to Rochester, Detroit to Saginaw your dream deck is only a phone call away at (248) 889-4910. From your first call or visit to one of Iverson’s Lumber Michigan locations, our decking experts will meet with you to understand your vision, your home, the site, deck size, budget goals and features you should – or shouldn’t – include. Iverson’s Lumber decking experts will then discuss the many material options when it comes to decking. From premium cedar to durable pressure treated lumber or easy-care composite deck materials the perfect product for your dream deck is available at Iverson’s Lumber. Railings and other deck hardware give you the opportunity to pull in color and detail that compliments your home and blends beautifully in your back yard. TimberTech capped composite decking is made in the USA. TimberTech decks are like wood but stronger. Now with an industry leading 30 year fade and stain warranty. Fortress Railing Products is an innovative building products manufacturer in North America with a vast distribution network, commitment to code testing, and groundbreaking product design. DesignRail® Aluminum Railing Frame Systems combine the durability of aluminum with innovative design details to ensure lasting beauty, structural integrity, and affordability while drastically reducing long term maintenance expenses. Ornamental wood ties, inserts and other accessories are the ultimate statement of style and strength by producing strong connections & enhancing your project design with accessories from Ozco. The TWP family of wood preservative products deliver the perfect color and treatment with the highest quality control standards in the industry. 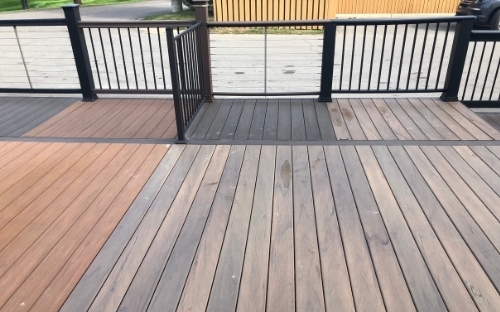 To get started on your dream deck, visit Iverson’s Lumber Deck Design Center in Highland or Montrose to compare options or call (248) 889-4910 for a free quote. Enjoy life outdoors with your dream deck. Decking products from names you can trust!